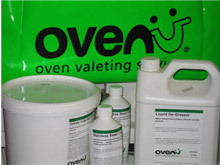 Thank you for taking a few moments to check-out the range of Ovenu Oven Cleaning Products. The first thing we’d like to point out is that the entire range of products used by our franchised network of oven cleaning and valeting professionals isn’t available to any other Oven Cleaning Companies. Ovenu products are only made for Ovenu! The exact product formulations are owned by the company so please be wary if a competitor suggests that they are using Ovenu products…they won’t be. 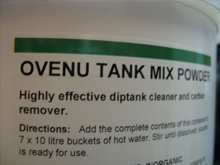 The powder that we use in our van mounted process tank is a heavy duty degreaser and carbon remover. What is extremely clever about this product is that there is no trace of caustic soda. We at Ovenu can guarantee this fact as we own the formulation. The powder will hold grease and fats in suspension. This means that only fresh cleaning molecules are used on every clean that we perform. When the clean molecules run out, we simply change the mixture. In combination with the use of only Hygiene Grade materials you can be assured of premium quality workmanship and a totally safe end result. Our de-greasing liquid that we’ll use indoors is water based. It doesn’t get much safer than that ! Our liquid degreaser will produce awesome results when we degrease your extractor hood, control buttons and dials etc. This product is also mildly scented to leave a fresh smelling environment when we’re finished. 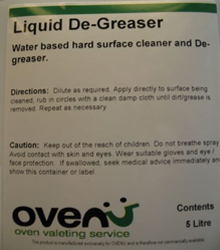 The Ovenu degreasing liquid is also biodegradable and, to be totally ‘green’, we supply this product to our network in recyclable containers. For the heavily soiled areas within the oven, the oven door and possibly your microwave oven, we’ll be using our unique Carbon Remover. This bespoke Ovenu Oven Cleaning product will produce great results for you and will leave you astounded at the end of the job. Used with the specialist tools that our Ovenu network members are supplied with, all traces of burned on debris will be safely removed. This product is also totally caustic-soda free. You’ll also be surprised that this powerful product smells so good and nothing like the pungent odours you get from using many supermarket aerosols. 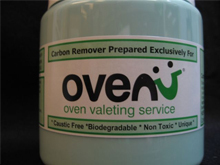 Ovenu carbon remover can be safely applied to all ‘self-clean’ liners and coatings. Please click here if you need more information about “self-cleaning” ovens. Last but no means least we’ll be using our Stainless Steel cleaner and polish to leave your cooking appliances gleaming. We want you to be absolutely delighted when we’ve finished the job for you so before we leave, everything that we’ve cleaned and detailed will be polished to a shine.